The Good / The only good thing about My Home Job Search is that some of the jobs are actually real. My Recommendation / If you're just looking to find work, then I'd recommend heading directly to a recruitment agency onlince. If you're looking to create an online career, then I'd advise you to avoid My Home Job Search and check out my number 1 recommendation. Online scam sites come in a wide variety of flavors, with one of the most popular right now being online job searches. 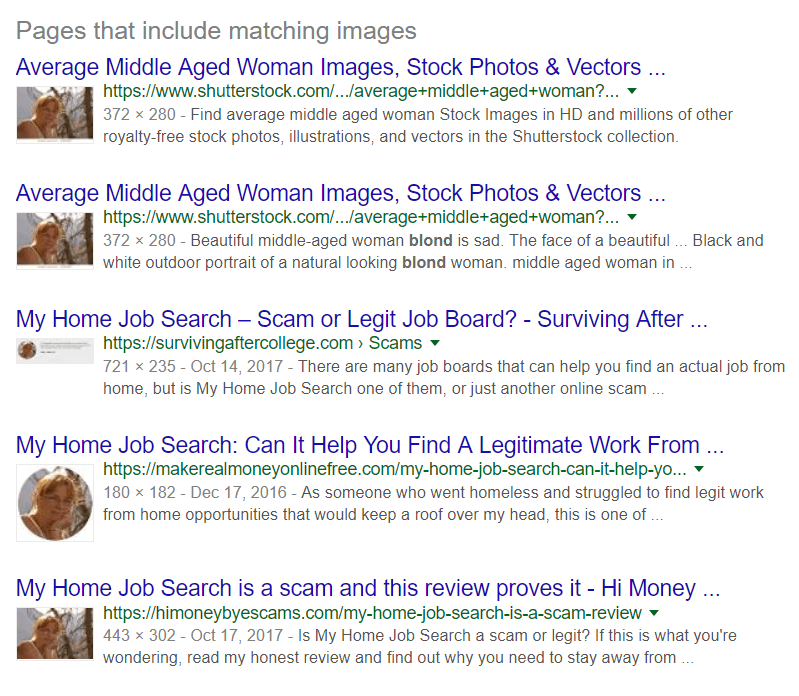 I recently came across one of these potentially scammy sites and thought it best to warn you about it: My Home Job Search. Before I get to the meat of this review I want to tell you about the way I discovered My Home Job Search. You see, this site has a variety of “feeder” sites linking to the main site itself. These do a variety of jobs but the main one is to warm you up to the main event, a kind of pre-sales. In fact it was this feeder site that made me suspicious in the first place as it is a fake news site. 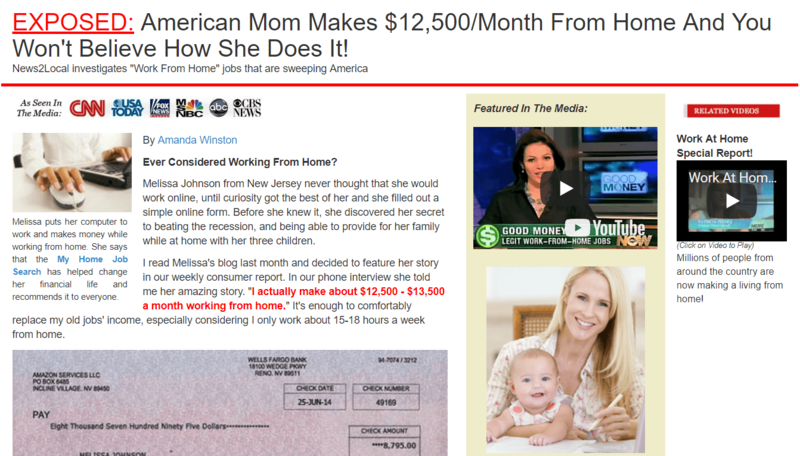 This “article” by Amanda Winston talks about a fictitious Melissa Johnson from New Jersey and how she made tons of money online. How do I know she’s fictitious? Well aside from having seen this scammy sales page a hundred times before, there’s a disclaimer at the bottom of the site which in normal English states that the entire feeder site is an advertorial and the details are fake. It insinuates that the data behind the information provided is real, but how can you trust something that uses stock photography, fake names, fake social likes and fake comments? The bottom line is you can’t and you shouldn’t! Clicking any links on the feeder site will take you to the main sales page for My Home Job Search. The page on first glance looks really professional and modern and really not scam like at all. That is until you scratch the surface. According to the sales page 485,529 people have liked this page on Facebook. With this number of likes you’d think they’d be shouting it from the rooftops and happy to see that number increase. Why then is this figure shown as an image rather than a live embed from Facebook? Is it perhaps because the Facebook page for this system actually only has a single like? At the top of the site is a search field where you can add in your ZIP code and find work. 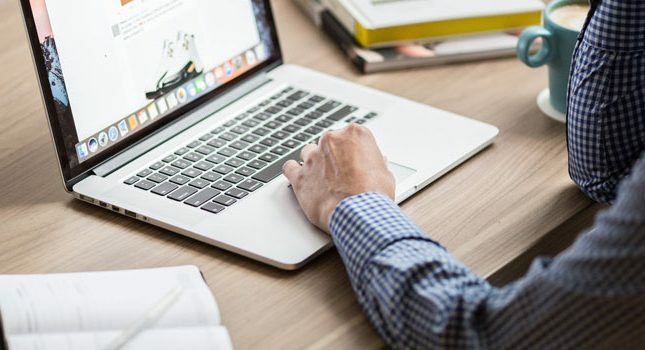 After adding in your ZIP code you’re taken through a few steps where you’re asked questions that supposedly filter the jobs for you, such as how much you want to earn a week, how many hours and whether you have basic typing skills. It really doesn’t matter what you select here, you end up at the same page that asks for more information such as your email and phone number. This is nominally so that potential employers can contact you but really it’s so your personal information can be harvested. After watching a video ,you’ll be asked if you want to save $60 and upgrade your account. Please don’t! If you ignore this and gain access to the members’ area you’ll see that this program isn’t all it’s made out to be. First, you’ll be offered to join some survey sites, which while they can make you money they often only make you a small amount and sporadically. My Home Job Search shows you these as they make money from the survey company if you sign up. The job listings for the site are not tailored to any of the questions you answered previously and cover all the options. In fact, these job listing are not even provided by My Home Job Search. Instead they have listed jobs from a free service called Zip Recruiter. The rest of the freely accessible parts of the site provide links to other services as well such as things like SwagBucks and CashCrate. These services are genuine but overall do not provide a regular income. This slideshow area showcases some existing members of the services all of which say how great it is. It’s a shame then that all of the photos are from stock photo sites. This in turn puts doubt on the reality of these being real testimonials, especially when you consider the fabrication of information already mentioned. 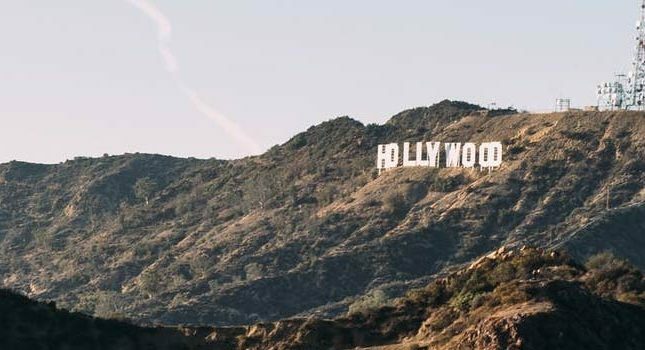 This video is added to the site is a legitimate news report that has been hijacked and used on numerous scam sites in the past and is likely to be seen in the future. It really doesn’t have anything to do with My Home Job Search; its sole job is to try to add some legitimacy to the site. Below the video is another trick used by unethical marketers: a list of legitimate news network logos. Again the sole purpose of these is to add a sense of legitimacy to an otherwise dodgy looking system. The juxtaposition of the news logos makes it seem like they endorse the website, or have even mentioned it at some point. We both know they haven’t. It’s always nice to know who you’re dealing with and it this age of identity theft, it’s really important to know who you’re giving your information to. Sadly, My Home Job Search gives you very little information. There’s an email and a phone number but there’s no information on what company is behind this site, an address or anything. You could be dealing with someone in Kentucky or Kandahar, who knows! With a lack of details you’ll not only be handing over your data to persons unknown but you’ll also have nowhere to go should you run into problems. The question that needs answering is whether My Home Job Search is a scam or not. The answer is a yes and no. The system lists genuine companies that can provide work in one form or another such as Zip Recruiter, so in that way it’s not a scam. However, the way My Home Job Search goes about it is dubious at best, a scam at worst. Blatant lies and falsehoods, not actually providing a service of their own but wanting to charge you for it, and not providing any information about the people or person behind it has all the hallmarks of a scam system. While I cannot say that this is an outright scam, there are enough warning signs to say that this is a system to avoid. Don’t give them your information and definitely don’t give them your money! You can access legitimate job sites without the need to hand over money.